Free wireless DSL. Stay in a remodeled island style one-bedroom condo with a King size bed, direct oceanfront condominium on world-famous Alii Drive. Remodeled kitchen and bath with granite counters. The condo sleeps 2-4 guests, with a sleeper sofa in the living room. The unit is decorated in tropical decor. Watch whales, dolphins, and sea turtles from your lanai (balcony) which is just 20 feet from the ocean, or just relax and enjoy the sunsets while dining on your private lanai. A sandy beach is located next door. A favorite for local surfers! This is a Non-Smoking Unit and complex. Your condominium is fully equipped with everything you need. From a complete kitchen to the little extras of VCR/DVD movies, CDs, games, puzzles, books, beach chairs/mats, and a cooler. Just bring your bathing suit and flip flops! Location! Location! Location! Centrally located in the heart of Kailua-Kona. Just a short walk to restaurants (casual to four stars), shops, art galleries, farmers market, great swimming, snorkeling, and diving nearby. Location, Location, Location !!! You have an unbelieveable 360 degree view of the Kona Coast line and a beautiful beach next door. Enjoying your meals (and cocktails) from the lanai watching the sunsets/sunrise and all of the ocean activitity going on right in front of you. It is hard to leave the lanai! With the great location you are just a short walk to restaurants and shops. Oh...and the oceanfront pool...a great way to relax or just read a book. Large double size walk-in shower. Granite countertops. Just 20 ft to the ocean!! Sandy Beach next to condo. Fully equipped condo just bring your flip flops & bathing suit!! Bath completely renovated with Granite counter, large double shower w/ seat. Phone w/Answering Machine, 2 Cable TVs (Living Room and Bedroom), VCR and DVD player, New Full Kitchen, New Appliances, Blender, Coffee Maker, Hair Dryer, 3 Ceiling Fans, Beach Chairs & Mats, Games & Movies, Beach Cooler for drinks, Great turtle viewing from the lanai by day and Sunset picture taking in the evening. We only stayed one night out of eight that we booked. Obviously we lost our prepaid booking fee that was paid in full. The building is grim, uncared for and badically a dump. The unit is direct oceanfront as promised but the bedroom is cramped and claustrophobic with bare basics bedding and no openable window. The towels are cheap and thin and soaps and shampoo from the lowest shelves at Walmart. panels in the pool security border are now translucent and ugly. Worst of all we had a terrible time getting the lock box open at the entry door as there is no light over it , just a shared down light for the other door and this entry also felt unsafe due to the poor to non existent lighting. I would be happy to forward my closing statement at our beach hotel that we are checking out of today to the owner ‘Leslie’ to prove we left after the first night. The bedroom windows do open. There are 2 operable sliding windows above the bed. We are very surprised you did not contact us immediately about your concerns. Prior guests have not found issue with the building, grounds or condo in the 17 years owing the unit. The ocean-front condo complex is a well-known sought after resort to stay with numerous returning guests. The bedroom bedding is brand new from Tommy Bahama’s (3 months old) and you can see the size of the bedroom from the pictures online before renting. In addition to the starter shampoo provided prior guests will leave shampoo for future guests. We do not judge the brands they buy. Since your flight arrived in the morning and checked in early in the afternoon the lockbox was easily accessible for the one-time use. As for the hall light next to the door I believe the HOA will be switching bulbs from florescence to LED. I have no guarantee that you did not returned to the unit to use the kitchen, washer/dryer, etc. during your stay as was evident by the dirty dishes left, w/d used, coffee grounds left in coffee pot and leftovers in refrigerator (per manager evaluating unit). My wife and I had a great time! Great location, nice unit, thank you. Beautiful location and a nice unit. Very well stocked with kitchen items and books to read. We had to buy Kleenex and toilet paper which ran out. We did not realize there would be no housekeeping services which you might want to make clear up front. Thank you for opening your vacation spot up to us. Couldn't have picked a better place to stay for our anniversary. The condo is beautifully updated and tastefully decorated with a fully stocked kitchen. 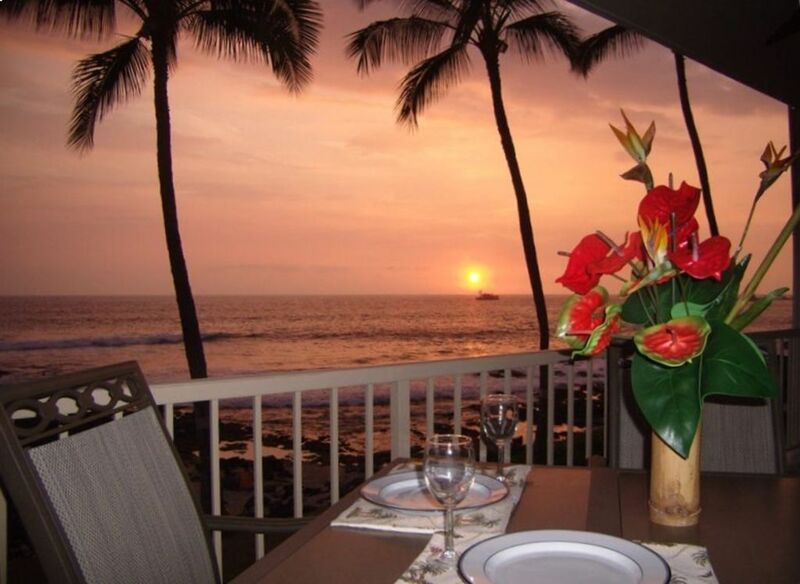 The view from the lanai is spectacular for watching beautiful Hawaiian sunsets, spinner dolphins and water activities. Leslie, the owner, was easy to work with and accommodating. The complex is very nice and centrally located within walking distance of numerous restaurants and shops. We will definitely stay here again. Beautiful ocean front just 30 ft from the second floor lanai. Loud surf sounds 24/7 and sunsets! Well maintained and appointed condo and grounds. 10 minutes walk to many restaurants. Condo is in a perfect location and the views from the balcony were amazing.